Innovations in music technology bring with them a new set of challenges for describing and understanding the electroacoustic repertoire. This edited collection presents a state-of-the-art overview of analysis methods for electroacoustic music in this rapidly developing field. 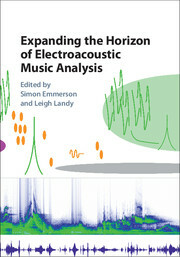 The first part of the book explains the needs of differing electroacoustic genres and puts forward a template for the analysis of electroacoustic music. Part II discusses the latest ideas in the field and the challenges associated with new technologies, while Part III explores how analyses have harnessed the new forces of multimedia, and includes an introduction to new software programme EAnalysis, which was created by the editors as the result of an Arts and Humanities Research Council grant. The final part of the book demonstrates these new methods in action, with analyses of key electroacoustic works from a wide range of genres and sources. Purchase paperback or ebook version from Cambridge University Press or Amazon. Some questions around listening: Vancouver Soundscape Revisited by Claude Schryer Katharine Norman.